It wasn’t that long ago that wedding gowns really only came in one of two colours – white or ivory. Then, as we’ve been emboldened by blogs and encouraged by magazines, we’ve all allowed ourselves to consider options and alternatives that just a few years ago would have been unthinkable. The rise in popularity of the non-white wedding dress has been wonderful to watch and I love them so. If you’re looking for something a little different, if you adore colours, if you fear looking washed-out or if you’re marrying for a second time and don’t want to wear white then consider bringing colour to your wedding with your gown. Let’s start at the softest part of the palette with sophisticated champagnes, nudes and blush tones. These are just perfect for dreamy romantics and the colour looks wonderful in creamy layers. I love the embellishments on the Reem Acra gown that disappear down the skirt. It’s an incredibly feminine, ethereal look that would suit so many brides. Blush pink is another current favourite and if you’re looking to work in metallic tones, it’s a perfect foil for golds and bronzes. 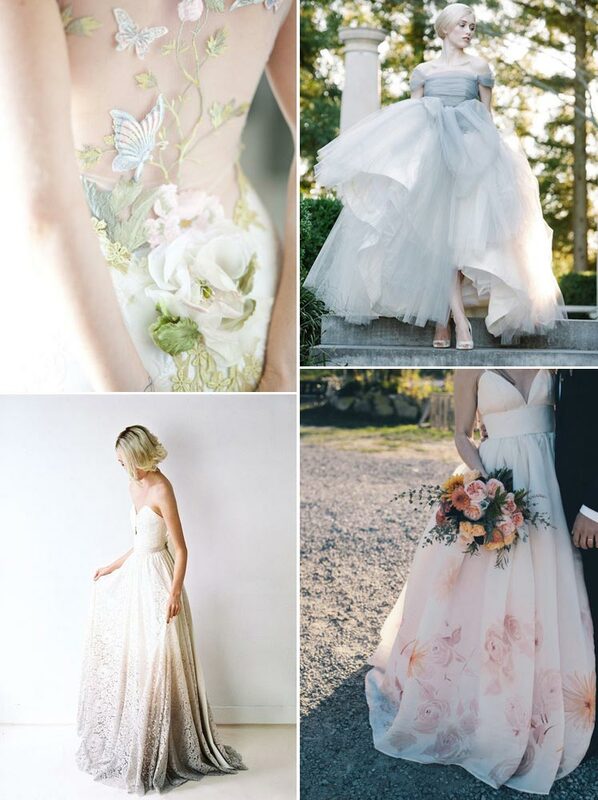 Pastels are another big trend in wedding gowns right now and rid yourself of any notion you might have of these being sickly sweet or too cute for your on-trend day. I am a huge fan of the pale grey Sareh Nouri gown – it’s eye-catching without being overwhelming and that’s the joy of modern pastels. 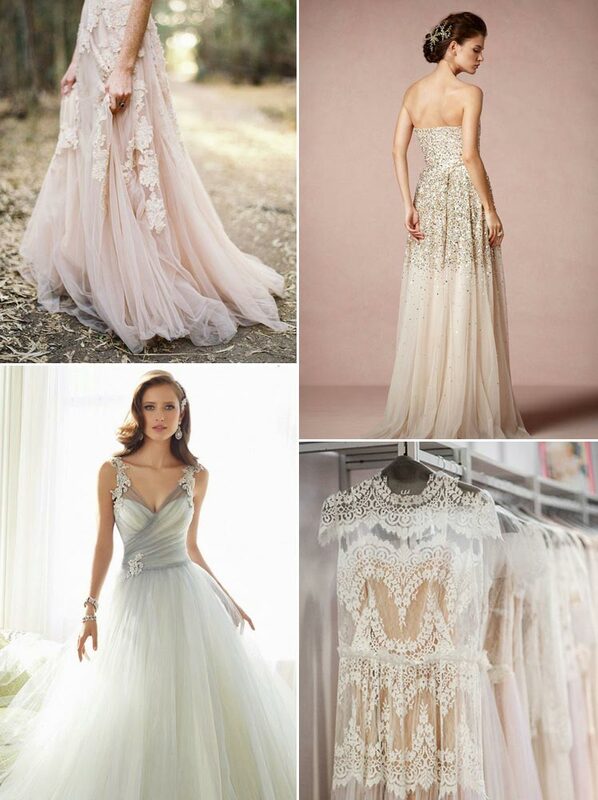 They’re sophisticated gowns that are subtly different and they’re just divine. I also can’t get enough of the blue Katya Katya Shehurina gown or indeed the green Claire Pettibone dress with the cowl back detailing. 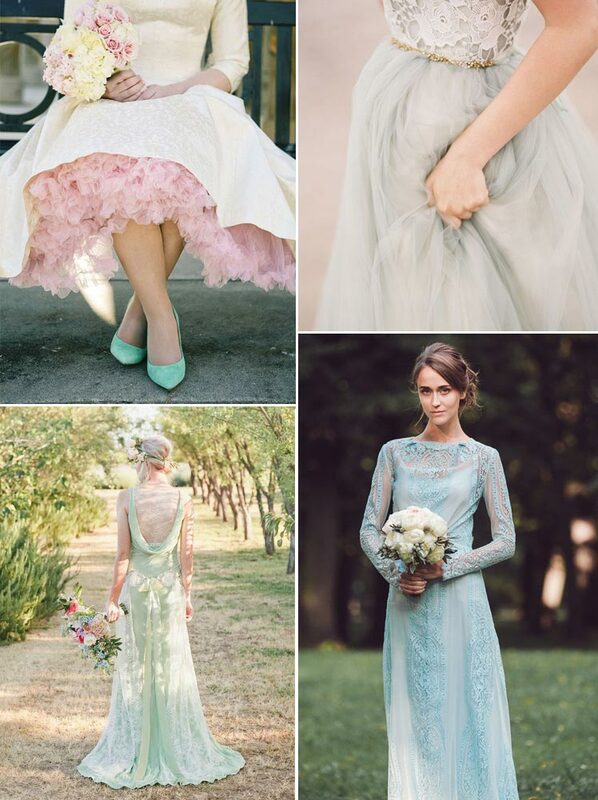 This, my friends, is how to wear a pastel wedding gown. If a fully coloured gown isn’t for you then you should certainly consider a pop of pattern or indeed a dalliance with dip-dye and, whilst it’s not strictly a pattern, the embellished back detailing on Claire Pettibone’s gowns are iconic in the wedding world. They add colour and interest and don’t forget that as your guests will spend your ceremony gazing at the back of your gown, they’re perfectly designed. I’m falling for patterned gowns and the floral motifs on the Kathryn Conover wedding dress are truly charming. You could certainly be bolder if you wished but a touch of whimsy is gently appealing to me. Dip-dye is also a huge trend for 2015 and again, the colouring around the hem of the skirt adds vibrancy without swamping the entire gown. I can imagine the look of the whole wedding from just that one gown! So, embrace colour and try something a little different for your wedding gown. I can guarantee you won’t be on your own but you will stand out!